This details the protections that immigrant workers at some workplaces have achieved through local UNITE HERE contract negotiation. SB4 is a Texas state law that forces local government and law enforcement to collaborate with ICE on immigration enforcement. This resource explains the law and recent court rulings impacting its implementation. This resource provides information to help employers identify issues they may want to consider before, during and after an ICE raid. Rights and best practices for employers if ICE comes to the workplace. A one-page overview of parental rights of those separated from their children at the U.S. border. This 5-page guide provides know your rights information for those who may have to leave the country suddenly around protecting assets and bank accounts, filing taxes, managing benefits and more. Executive Order 13767 issued by President Trump on January 25, 2017, regarding border security and immigration enforcement. A helpful guide for employers and employees on ICE Raids, I-9 Audits and Succession Planning compiled by Small Business Legal Clinic, Immigration Counseling Service, K&L Gates and Perkins Coie. Know what your rights are and how to defend them. Deportation Defense Cards available in English and Spanish. 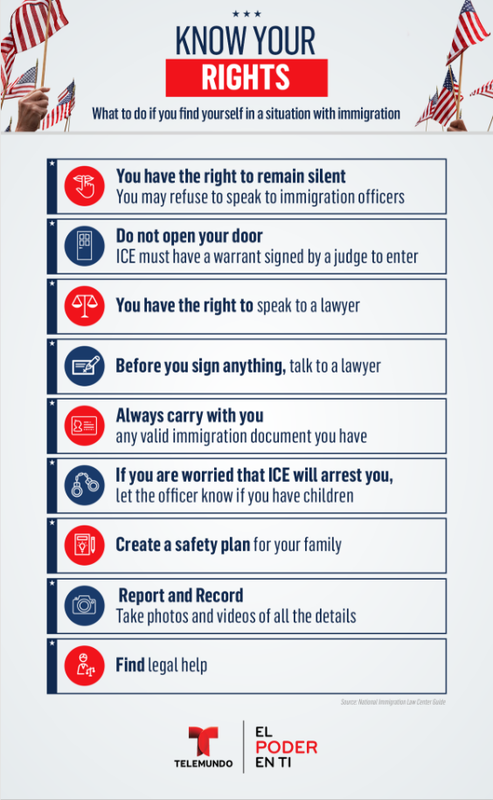 A Know Your Rights card with tips on what to do if ICE comes to your door. This resource is meant to provide refugee and immigrant communities with urgently needed information to know their rights. This Know Your Rights video is a guide put together in response to the increase in raids since President Trump's executive order eliminating USCIS enforcement priorities in January of 2017. Immigration agents may be violating your rights in a new wave of raids. Know your rights. A summary of Trump's immigration enforcement policies, current as of January 26, 2017. Executive Order 13768, signed by President Trump on January 25, 2017. The order regards interior enforcement, including sanctuary cities and detainers. A webpage with resources on Trump's Immigration Executive Orders. Current as of February 2017, this fact sheet describes the effect of the Trump administration's immigration raid and the rights of non-citizens. A summary of Trump's interior enforcement executive order and how it will affect deportations and sanctuary cities. A guide to Trump's Executive Orders, available in Spanish. // Un resumen de las Órdenes Ejecutivas de la Administración Trump, disponible en español. Hotline number: 1-844-363-1423. Call the hotline to report ICE activity in your city. A list of constitutional rights for citizens and non-citizens. 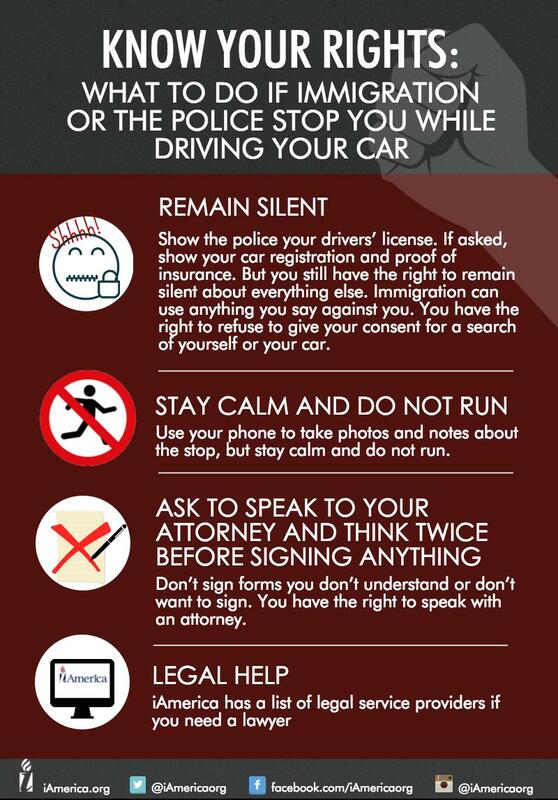 What to do if you are stopped by the police or immigration officials while driving your car. 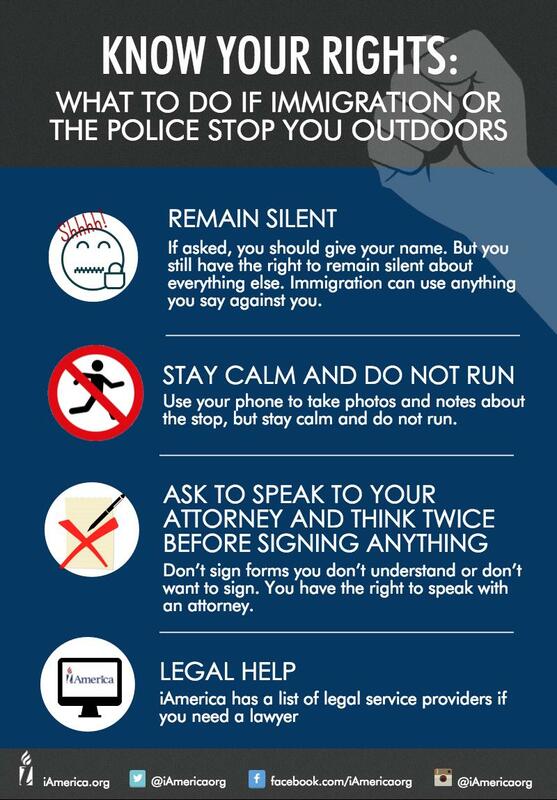 Read this card for a summary of what to do if immigration or the police stop you while you are outdoors. Read this card for a summary of what to do if you are arrested by immigration enforcement or the police. This resource outlines your rights in jail, including remaining silent and finding legal assistance. 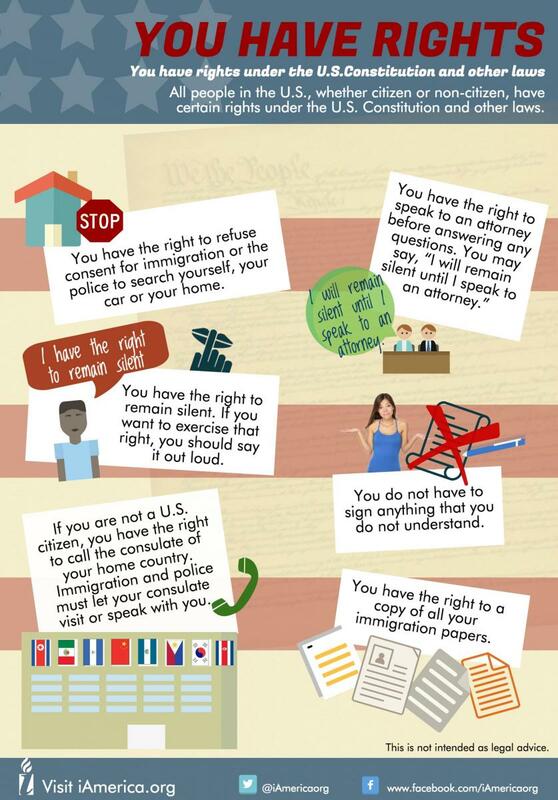 A list of basic constitutional rights for citizens and undocumented immigrants in the US, especially regarding contact with ICE and law enforcement. What to do if you are questioned by police, if immigration comes to your home or workplace, and how to develop a safety plan. Advice for DACA students under the Trump administration. A list of states that provide drivers licenses to individuals regardless of immigration status, current as of May 2017. What to do when you come in contact with ICE agents and how to develop a rapid response plan . A resource for those in immigration detention and removal proceedings. This document outlines grounds of removability based on criminal convictions and forms of relief. This resource states the different rights and protections immigrant workers have when they engage in protests and is current as of April 2017. Your rights when you are stopped, questioned, arrested or searched by law enforcement officers. This is helpful for citizens and non-citizens. iAtención! Protegase de las redadas de inmigración! // Attention! 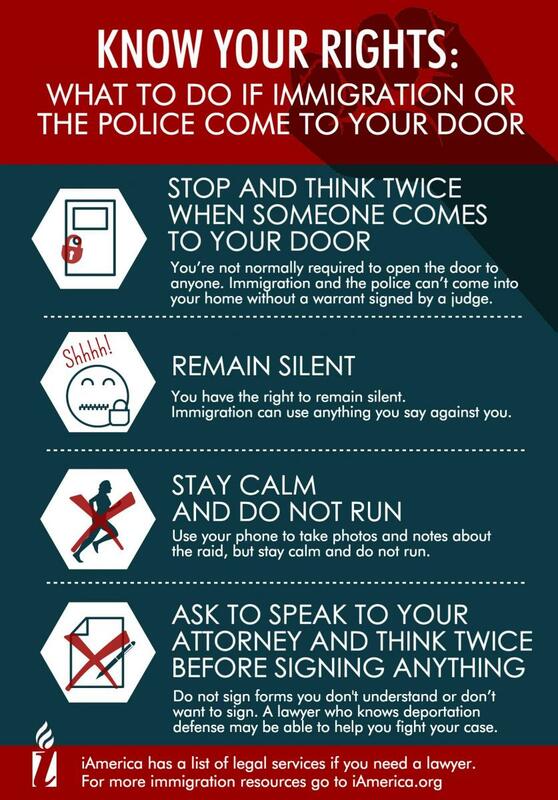 Protect yourself from immigration raids. How to protect yourself against immigration raids in Maryland. How arrests, citations, and tickets can affect your immigration status. // Cómo los arrestos, las citaciones y las multas pueden afectar su condición migratoria. How to protect yourself when immigration shows up at your doorstep, workplace, or union. Hotline number: (408) 453-3017. A free immigrant hotline for legal information and referrals to low-cost community resources. A how-to page to file a complaint of discrimination. The UC Immigrant Legal Services Center compiled FAQs for dreamers after the election, including questions on renewal and Advanced Parole. New York City specific policy briefs on ensuring equal access to government services and health care. Hotline number: 1-800-566-7636. Immigrant Assistance and Referral Hotline, hosted by the New York State Office for New Americans. A comprehensive guide to city, state, and federal services including access to benefits and language access rights. Information on bonds, ankle bracelets, and mental health protections for detainees. A brochure explaining the different types of visas available for victims of crime, including U visas and T visas. A comprehensive resource with information on U visas, asylum, and DACA. This up-to-date Immigrant Legal Resource Center page includes resources on enforcement, including information on ICE administrative warrants and detainers. Information for AB60 non-citizen drivers and advocates under the Trump administration. An FAQ page for students, educators and social service providers about DACA, visa applications, and deportation. Tips for immigrants in the workplace, including immigration assistance services, employment agencies, and tax preparation. Comprehensive Know Your Rights cards available online in a variety of languages including Khmer, Korean, Spanish and Urdu. A pamphlet for victims of sexual abuse in detention centers. Information for non-citizens who encounter law enforcement at the U.S. border. 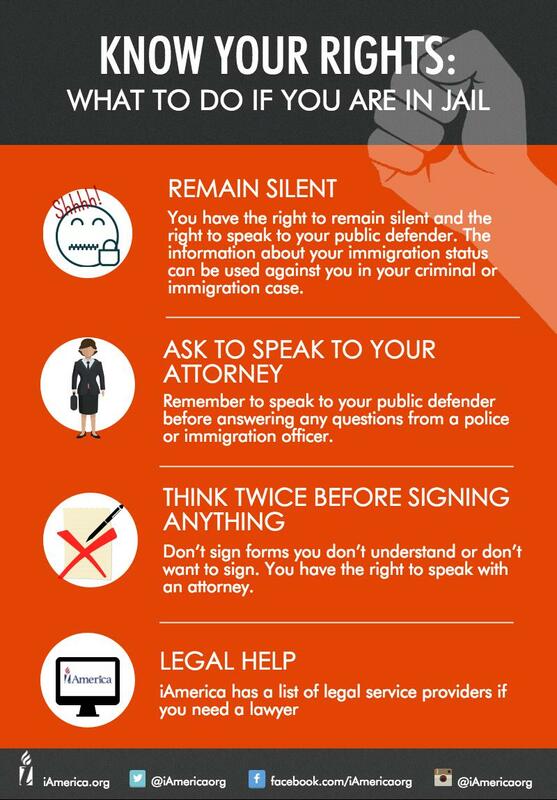 This resource outlines your rights when you encounter law enforcement, when you are questioned about your immigration status and taken into ICE custody. A video and interactive resource to learn your rights when you are questioned about your immigration status by law enforcement. An informative Know Your Rights video that explains what to do if ICE or immigration authorities show up at your doorstep. A Know Your Rights film by the Coalition for Humane Immigrant Rights. Closed captioning available in Spanish, Korean, and simple Chinese. An interactive site by Telemundo that includes information on naturalization, green cards, DACA, and free legal services. 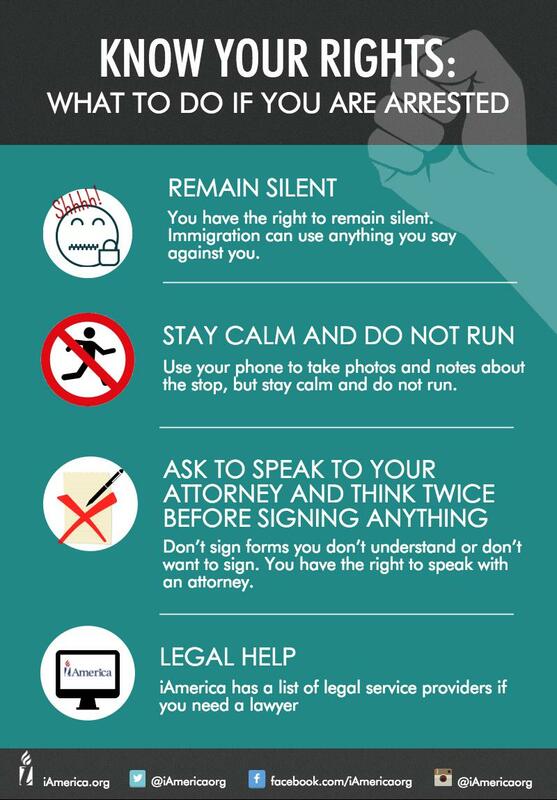 A simple graphic that contains advice for immigrants in the event they come in contact with ICE. A list of services offered to low-income immigrants by CASA de Maryland, including housing, employment and immigration matters. The Legal Aid Justice Center provides free legal assistance and Know Your Rights education to immigrants in Virginia. Check your eligibility for immigration benefits, prepare your paperwork, and/or schedule an initial consultation through Road to Status. Available in English, Spanish, Chinese, Vietnamese, French, German, Korean. Hotline: 877-881-8281. The network connects rural communities to organizations that provide legal services to farm workers. This guide explains how U.S. border agents may search phones, laptops, and other electronics at the U.S. border. It offers a brief technical overview to securing digital data. This toolkit provides resources for advocates to defend against anti-sanctuary city proposals and includes state-specific fact sheets. This toolkit is designed to help policymakers, at the local level, who wish to create or further strengthen sanctuary style laws and policies. The policy guidance in this toolkit is directly informed by the important lessons of cities and counties who have lead these efforts to date.